I wonder what’s behind that rage. What set them off? Remember now, these are the people with whom Jesus grew up. They are his hometown people. They know him and his family. And not only that, they are religious people. They’re the ones who have shown up at the synagogue today. They’re the ones with whom Jesus worshipped, prayed, and studied scriptures. And now they drive him out of town and want to “hurl him off the cliff.” What’s gotten in to them? What did Jesus do or say that was so upsetting? I used to think it was because he was bringing good news to the poor and sight to the blind, because he let captives go free, and chose to stand on the side of the oppressed. We heard that last week when Jesus read from the prophet Isaiah.That’s what he is saying has been fulfilled today in their hearing. Today’s gospel (Lk. 4:21-30) is the continuation of last week’s (Lk. 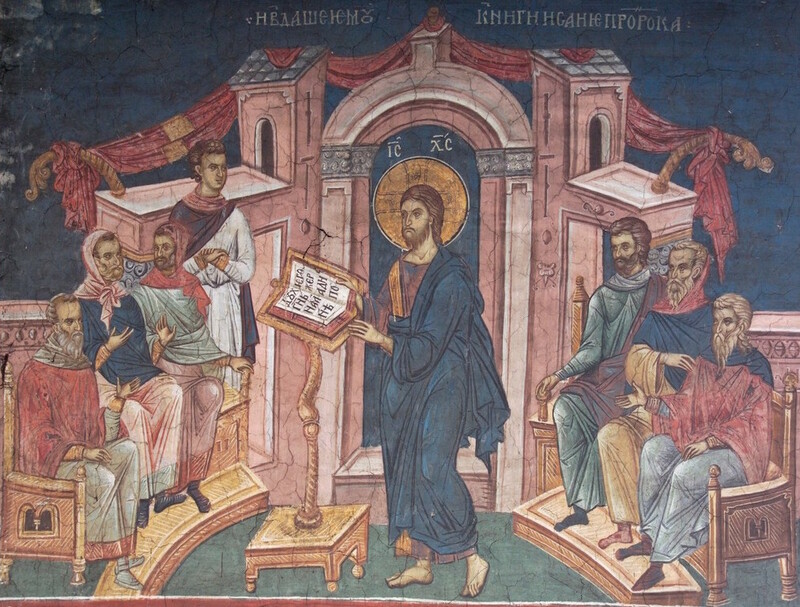 4:14-21). None of that stuff about the poor, the blind, the captive, or the oppressed, however, would have been a surprise to the people in the synagogue and it shouldn’t be to us either. Moses, the law, and the prophets are very clear about God siding with the poor, the oppressed, the outsider. The writer of Deuteronomy says, God “loves the stranger, providing them food and clothing. You shall also love the stranger, for you were strangers in the land of Egypt” (Deut. 10:18-19). Ezekiel says that the sin of Sodom was that the people “had pride, excess of food, and prosperous ease, but did not aid the poor and needy” (Ezekiel 16:49). And let’s not forget God’s questioning through Isaiah: “Is not this the fast that I choose: to loose the bonds of injustice, to undo the thongs of the yoke, to let the oppressed go free, and to break every yoke? Is it not to share your bread with the hungry, and bring the homeless poor into your house; when you see the naked, to cover them” (Isaiah 58:6-7)? They liked what Jesus was saying, until they didn’t: until Jesus reminded them that Elijah passed over all the hungry widows of Israel to feed a widow outside of Israel; until Jesus reminded them that Elisha passed over all the lepers in Israel to heal a foreign leper, an outsider; until they recognized that Jesus was passing over them, his hometown people. And I can’t help but wonder if we might not be the hometown crowd, if we somehow see ourselves as Jesus’ favorites. I can’t help but wonder if we don’t also assume some privileged status when it comes to Jesus, as if he always chooses (or should choose) our side, our church, our party, our country. And I can’t help but wonder if we’re not also in danger of being passed over. Let me be clear here. I am not talking about being passed over as a rejection or punishment. I am talking about being passed over as a consequence of failing to recognize our brokenness. I am talking about the way we as a country are filled with rage. I am talking about the way we rage in our lives to disguise and compensate for what hurts inside us. You see, I think the people’s rage that day was just an expression of their hurt. I suspect we rage to avoid the emptiness and hunger within us. We rage to avoid having to look at the way our flesh is rotting. We rage when our privilege is threatened. We rage so we do not have to face ourselves. And behind our rage is a broken heart. The people in the synagogue that day were broken hearted, and they raged. And who here doesn’t know what that’s like? What if the only difference between the widow of Zarephath and all the other hungry widows in Israel is that the widow in Zarephath knew her heart was broken? What if the only difference between Naaman the Syrian and all the other lepers in Israel is that Naaman knew his heart was broken? What if the only thing between us and being passed over is recognizing and naming our broken heart? And what if we could do that not only for ourselves but for each other and for the world? I don’t know what would happen, but it could begin a different conversation. It could change the way we see ourselves and each other. And it just might open the doors to a new way forward. Because, regardless of who we are or where we are from, regardless of what we believe about God, country, or politics, regardless of our presumed privilege, regardless of who we see as right and who we see as wrong, if there is one thing that we all have in common, one thing that unites us, it is that we all hurt. We all hurt and Jesus knows that. So do the prophets of God; Elijah, Elisha, Isaiah, Ezekiel, and Moses. They all know this. Hi, Michael. I very much appreciate what you’ve written for this passage! I had signed up to preach this past Sunday and it wasn’t coming together for me. Our sister Carol Andrew was preaching elsewhere so I asked her to give her sermon to us at the convent as well. She preached a powerful sermon on Paul’s discourse on Love—which might not have been what she preached to the other congregation. I was frustrated not to have wrestled more with this passage, and I’m thankful to have read your sermon on it! It’s intellectually and emotionally gratifying. I can go from it in peace, now. Ann, thank you for reading my blog. I too know those frustrating days when the sermon doesn’t come together. I hope you and your sisters are well. I remember you all in my prayers.